A grateful thank you to Ron Jackson at DN Journal for featuring dotStrategy President Bill Doshier, and the .BUZZ registry as their March/April cover story. Text from the feature article is posted below. The complete story with photos can be found at the DN Journal here. Hundreds of new domain extensions have been introduced over the past year with most of them scooped up by well-funded corporate entities. Donuts.co alone operates more than 150 new gTLDs and plans to add dozens more. Still, if you look closely enough you can spot an occasional David among the Goliaths like Donuts, Uniregistry, Minds+Machines, Rightside, Radix and even bigger behemoths like Google and Amazon. One of those Davids who operates just one new TLD registry is actually a Bill – a self-described Arkansas born and bred country boy named Bill Doshier to be exact. Already hailed as one of the nicest guys in the business, Doshier has a daunting task ahead – making his .buzz TLD as popular with the general public as he is among his fellow domain entrepreneurs. So just who is this new kid on the block that is going head to head with a lot of guys who have been in this industry before it was even an industry? And why does he think he can weave his way through the highly competitive new gTLD minefield, armed with just a single TLD, without getting squashed in the battle for attention by the big boys and their blitzkrieg of new names to the right of the dot? Well, any good entrepreneur has to believe they can beat the odds and it turns out that spirit is deeply embedded in Doshier’s bloodline. Yes, Bill is a down home guy (born in Harrison, Arkansas, a small town near the Missouri border, 53 years ago), who was always outdoors hunting and fishing with family and friends or rooting for his beloved University of Arkansas Razorbacks – but the Doshier clan knew more than a little about business too. “My own disposition as a risk taker developed quickly during college. I wasn’t a very serious student. I made B’s, enjoyed playing poker, shooting pool, road tripping to the horse races and of course following the Razorbacks. These activities all funded by numerous photography jobs. My junior year an increased interest in making money and the stock market ensued. I began focusing more on business courses, taken as electives, than I did my core journalism degree courses. In 1983 I graduated from Arkansas with a journalism degree, immediately married Ms. Nita Williams, and started my first job in Little Rock as a stockbroker. Crazy!,” Doshier laughed. It turns out things would get even crazier as Doshier made his way through the business world. “A three year stint as a stock broker rolled into a short two year career trading options on the Chicago Board Options Exchange, going broke, and moving from Chicago back to Arkansas,” Doshier said. “By my 10-year high school reunion, I was out of the brokerage business. A purchasing position with a local manufacturer paid the bills for a few years. My son Michael was born, followed immediately by a lay off. In 1993 I accepted an entry level sales position with a distribution company out of Houston, Texas and my daughter Abby was born shortly afterwards.” As you will learn later in this story, that entry level position blossomed into something much bigger for Bill – but first things first. “In late 2010 I connected with Ken Hansen at Neustar (who is now Co-Founder and CEO of the .CO.COM registry). Ken, as Ken always is, was so welcoming and nice to me on our first visit. I asked him if I could come visit him at Neustar to further discuss my ideas for applying to operate a registry. He ask me when do you want to come up? I was at Neustar headquarters the next week for a face- to- face meeting with Ken. Leaving Neustar I was convinced this new registry opportunity was an event I wanted to be a part of,” Doshier said. “In early 2011, Ken joined me in Houston for a board of directors meeting. We presented TLDs together to the board and to my disappointment, nobody got it – nobody agreed with me. I was later told this was not part of the company’s strategic plan,” Doshier ruefully recalled. Now the $64,000 Question (actually the $185,000 question as that’s what it costs just to apply for each new TLD). How did Doshier settle on .buzz as the extension he would go into battle with? “I understood early on, during the application process, that in order to avoid a ‘contention set’ (Editor’s note: if more than one party wants the same extension it is put up for auction, favoring those with the deepest pockets) I must search out and apply for keyword strings that were a bit under the radar. I still have the list of hundreds of words I considered applying for. Picking just a couple of TLD names was a grueling selection process. I actually changed my application paper work with Neustar three times before finalizing my selections,” Doshier said. As a lone entrepreneur going up against giant corporations Doshier’s options are obviously limited but he is more than happy with his lot in new gTLD life. He may not have the bankroll the big boys do but he has the freedom to do things any way he thinks is best. “I‘m 100% owner of dotStrategy and the operator of the .buzz registry,” Doshier said. He relies on two trusted to advisors to help with the registry workload. Doshier continued, “Most exciting was the meteoric rise of .buzz toward delegation. Being a single applicant for a TLD did have significant advantages. Due to the number of contention sets, .buzz moved from an initial ICANN prioritization of #746, to becoming one of the first 50 new strings launched. I signed my ICANN contract in October 2013, Pinky Brand advised me on my Registrar agreement, and we began contracting with Registrar partners immediately. .buzz Sunrise began February 2014, Landrush in March and finally we went live in General Availability, April 15th, 2014. Easy to remember our anniversary, tax day!”, Doshier laughed. “You go through so many events during the launch process that your ‘go live’ day turns into just another day in the process. I do remember being on edge, but very proud of the accomplishment of taking .buzz live. I remember being elated with the first registration totals that Neustar reported, then disappointed as the totals slowed down later that day,’ Doshier recalled. “That afternoon, we threw a big party at the University of Central Arkansas (UCA) where I work as an instructor in the marketing department. Marketing students planned the party and called it Buzz Bash. Buzz Bash served as the official launch event for the .buzz registry, as well as a celebration of the UCA startup community. We had a great turnout from the University and local business community. The students start-up businesses were on display. We served hot dogs, gave away t-shirts and gave free buzz haircuts all afternoon on the UCA campus. By the way, I did get a buzz cut and will do so again this April 15th!”, Doshier promised. Doshier has gotten another big break since being awarded .buzz. Widely heralded entrepreneur Howard (the former CEO of Vegas.com who is now Founder and CEO at One Degree World) decided to use .buzz domains as a foundation for his ambitious new global travel and entertainment network that has already featured .buzz domains on national TV and in leading newspapers. 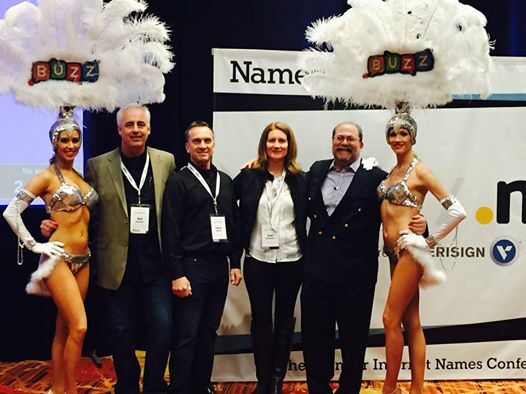 Lefkowitz announced his new venture involving hundreds of new gTLD domain including Vegas.buzz and Vegas.club at the 2015 NamesCon conference in Las Vegas in January. “For two weeks on Wheel, travel.buzz promoted its global destinations’ .buzz websites. This was a very large marketing investment to spur visibility and demand for Howard’s new travel and entertainment platform. To this date it’s the largest single effort by far to present and promote the acceptance of the new TLD program to the general public. Howard is to be commended for this effort,” Doshier added. We do what each of us does best; I supply him names, he builds his brand. I truly believe Howard takes over the travel and entertainment space in very short order. He’s a visionary and his track record speaks for itself,” Doshier declared. Doshier is now one year into his big adventure and has already caught some great breaks – but he is convinced the best is yet to come despite having hundreds of competitors battling for market share. “Absolutely, it’s competitive selling domain names but this is such an incredible business model. So much potential in front of us,” Doshier said. There have been reports that new TLD registrations have been lower than expected for many operators. .Buzz will end its first year with just over 10,000 domains registered. More than 70 new registries have higher totals but .buzz’s premium registration price has brought in more total revenue than that of many registries that have far more domains on the books. We asked Doshier if registration results were meeting his expectations. 47% of .buzz names are parked domains, and the number continues to go down. Relative to other new gTLDs launched in early 2014 along with .buzz, this is a low percentage. 70 registrars are contracted to sell .buzz domains. Despite his enthusiasm, Doshier is fully aware that there are major differences in opinion as to how the new gTLD program will play out as time goes on. Many in the .com camp believe the extension is in an unassailable position and that it will always be the top choice for businesses and major corporations. We asked Doshier what he thought the landscape will look like 5 to 10 years from now. “It’s so exciting to watch the development of the new TLDs. For the first time, in a long time, there’s value now on both sides of the dot. Examples like Howard taking on .buzz, .club and .vegas for his new venture. Seeing .nyc plastered all over New York City. The move into China by TLD Registry and others, UniRegistry basically owning NamesCon last January. This new domain train has left the station for good, and I think the momentum is remarkable one year out. I’m relatively certain the millennials, this next generation of innovators and creators driving the Internet forward, will opt for a hip relevant new TLD over a .com for their new start up site, blog site or investment opportunity,” Doshier said. And what if things don’t go the way Doshier expects? “I remember while struggling to make it as a trader in Chicago having a conversation with an old pro, and me telling this fellow how tough it was to make it on the floor of the exchange. He looked me straight in the eyes and asks, “Have you gone broke yet?” I said, “no”. He concluded, “Oh well, you have to go broke first before you’ll ever make it here.” And I did. There’s nothing wrong with failing. It’s going to happen. Understand this and go for it!, the natural born risk taker from Arkansas concluded.